Y'all know what day it is? Yup, Friday. And y'all know what that means, right? The ladies are throwing down with the questions. Mama M. gives us five, Tamara throws in another, and at the end of the day, we all know a little more about each other! And I LOVE it! First though, a quick update! I didn't win Keely's fab jewelry, but I DID win Lucy the Lamb from Mama M! There are still great giveaways going on out there, and I'm gonna win them all YOU still have a chance to win too! Check out a few of them here! Ok, so if you don't already know the rules of the road, they are both pretty similar! We share the questions, give our answers, be sure to link back to our lovely hostesses, and invite YOU to play along! You can post it to your blog if you have one, but if you don't, we still want to know, so share in the comments! If you blog it, be sure to link up with MckLinky so that we can all find you! Mama M. is for realz on a Christmas kick! Christmas Day is the big huzzah usually. I've talked before about how, since at this point I'm the only one with small children, everybody comes to my house Christmas morning! Only, this year, it's going to be different, because my Dad and Step-Mom won't be here. They are coming, but they live in TN, and are going home on Christmas Eve this year instead of Christmas Day, because there's this football game with some team called the Titans, and they are the big tailgaters and stuff. So, we're changing things up a bit this year. I don't like it. Won't lie. But, I'll cope. And anyway, my mom and my brothers and their wives/respective others will still be here, and my kids will be here, and we're going to have a great time! I am. But, I lose. I'm in the same boat as Mama M! With all of the color and crazy that is my tree, colored lights were just gonna be to much! So, the tree sports white lights. I do put colored lights up in the windows though. I catch myself watching stuff with the kids every once in a while, but usually it's movies (especially now that the crew has figured out how to use the OnDemand features of our cable!) Since my kids are 6, 7 & 8, we get a LOT of Disney Channel stuff going on here, the Hannah Montana and the Suite Life, and some Wizards of Waverly Place. I find that I want to throw something through my TV more with the Suite Life stuff, and not so much with the Hannah Montana, but honestly, I'm so adept at tuning it all out, it's not an issue much. I LOVE the Veggie Tales stuff. Larry Boy makes me laugh. I get a kick out of fun interpretations of Bible stories. (Hello, Dave and the Giant Pickle.) And they make me feel good about letting my kids watch stuff. Oh, and hubby and I both will grab a chair to watch The Penguins of Madagascar! Funny!! Ok, now it's your turn! 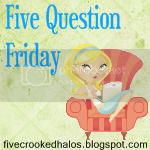 Post your answers and be sure to visit Tamara and Mama M. and link up! We love The Penguins of Madagascar too. I completely forgot about them. Congrats on winning the lamb, I'm a little jealous, but mostly happy for you. Can you tell me what site helped you get the scrolling widgets on your blog? My two year old is currently obsessed with the holiday episode of Barney. Like 2x/day obsessed. More if I would let her. Fun! How cool you won Lucy the Lamb! I was realllllllly hoping to win Keely's jewelry! Cannot stand Barney here, either! I'm so thankful my daughter isn't obsessed! LOVE the Veggie Tales! We have the standard story videos (King George and the Duckie is my fave!) but my kids really love the song DVDs as well. My hus even appreciates the "No Hair For My Hairbrush!" Congrats on winning the Lamb! And you are seriously so good at PR!!! And I can't wait until they are old enough for Disney stuff - I could watch that no problem. Corny, but not bad. My daughter loves Barney. Ugh. I could do without him, but he is still not as bad a Sponge Bob...that little moron!